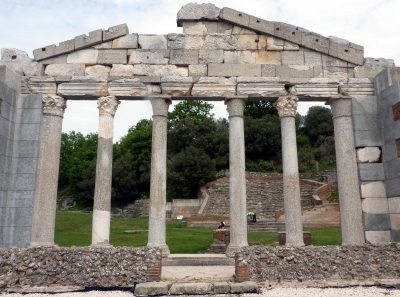 The Ancient City of Apollonia is part of the Tentative list of Albania in order to qualify for inclusion in the World Heritage List. I will try not to repeat observations made by Stanislaw in his review but there are some additional aspects which, I think, are worth covering. In summary - the impression you should gather is that Apollonia is a “significant” classical Greco-Roman archaeological site with a fine “central area” of excavated structures in “good” condition - Bouleterion, Libaries, Odeon etc etc and well worth visiting. 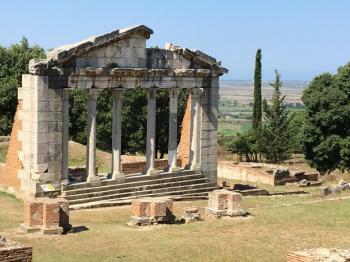 Albania has opted for the “Archaeological Park” model for a number of its major sites including this one. The country’s lack of development presumably made it easier to designate quite large areas of countryside for this purpose and, as at Butrint, there is value and pleasure to be gained from simply exploring the sites in a natural setting. The low numbers of tourists compared with many Mediterranean sites is another bonus! I get the feeling that UNESCO could have this site “pencilled” in for inscription once all the necessary work on protection etc has been done - though how long that might take is another matter! There are a number of notice boards around the site indicating that development money has been provided by various countries and by organisations including UNESCO. The latter’s "Millenium Development Goals Achievement Fund" (MDG-F) has supported both the restoration of Apollonia's museum and the production of a nice little brochure about the site (if you are visiting then you might like to download it from that link as we were not offered it!). The Museum , situated in Byzantine monastery buildings near the site entrance, has a particular significance - both because it and its contents are rather fine and because it represents another stage in the development of adequate protection for Apollonia. In 1991 it was looted during the civil disturbances which spread across Albania and stayed closed until 2011. Preservation of the site is not yet fully established however - as recently as Feb 2017 a case of theft of artefacts was prosecuted. When you visit the Apollonia Museum (NOT to be missed!!) you will see an exhibition primarily of Greek and Roman artefacts. But look out for a magnificent Bronze shield. This article describes how the shield has been reconstructed, in a 20 year project, from over 8000 pieces. It was discovered in one of the Necropolis Tumuli. When I commented to the museum guardian that I was surprised that the National Museum in Tirana hadn’t taken it he replied that they had “tried to”! Indeed the museum is very proud of this recent acquisition and displays it on its logo. The article describes it thus - “The shield belongs to the period of Alexander the Great. The shield is of the Macedonian (IV Century BC) type, and this can be seen from the shape and construction”. The label under the shield in the Museum however states – “Illyrian Shield 4th Century BC”. And this, even though it sits in its cabinet, next to a couple of helmets clearly marked as “Macedonian”!! This question plays back into the “Illyrian issue” which I covered in my review of the tombs at Selce e Poshtme. How much difference there really is between artefacts of the period from “Illyrians” and “Macedonians”, or even between the peoples themselves, all of whom would have been “Hellenised” to some degree, I don’t know - but some one clearly wanted to present this shield as “pure” Illyrian! So - what are the chances of Apollonia being nominated in the near future? I take as given that the Archaic to Roman aspects possess OUV in the form of significant, well preserved remains from this long period of occupation and for the light they shed on interactions between the various peoples of the area across that period (Crit iii “bearing extraordinary data on the ancient culture and the coexistence between Greeks and Illyrians”). The extant Christian remains are Byzantine dating from the Early 13th C and whether they are really “needed” is another matter - they are limited to the Church/Refrectory whose frescoes are quite interesting but which has no close/continuous “connection” with the rest of the site. Nevertheless it gets Crit ii all to itself and probably can't simply be "left out"! Also, I can’t see the need, as the UNESCO T List entry currently states, to propose it as a mixed site by including Criterion x. just because it is the home of the “endangered Hermann’s tortoise”! I suppose that the mixed aspects of Butrint are being used as a “model” but in this case it would seem to complicate matters unnecessarily! The biggest barriers to nomination would still seem to be managerial - preservation and security. Though these may be approaching “satisfactory”? We visited (unknowingly) on “International Monuments Day” and met the young female director of the site who had been despatching a school party and explained why we were not being asked to pay our 700 lek pp entrance fee at the guichet! I asked about possible future nomination but obtained no information which indicated that anything was “active”. Indeed, she somewhat surprisingly commented that it might be “paired” with Byllis - another Albanian archaeological park around 45kms away which isn’t even on Albania’s T List. Albania had success with the dual sites of Gjirokaster and Berat but these were inscribed in series rather than together. Whilst both sites have histories going back to 4th C BC, traded together and had many historical developments in common etc, the closest connection between Apollonia and Byllis was in 5th C when they “shared” a Bishop. That connection link wouldn’t seem strong enough for the addition of the second to be required to strengthen the OUV of the former. Regarding access to the site. We made a big mistake when driving from the south by following our GPS and turning off on to a minor road at Levan. It may have been the “direct route”, but it gradually disintegrated and could be impossible after wet weather. We eventually diverted onto the “long term” incomplete “Fier bypass” which is part of an intended A2 motorway from Tirana to Vlore. It is currently just a gravel bed with occasional diversions at incomplete bridges but, nevertheless, is being used by traffic! From Levan it is far better to go round 3 sides of a square into Fier and back out on SH94 and 66 which has apparently been “improved” - though it didn’t seem so when we used it to leave! The motorway, incidentally, makes a large diversion around the hills on which Apollonia is situated and its route is a matter of interest in relation to Apollonia’s potential inscription. The 2011 EIA ( Environmental Impact Assessment ) by the EIB (European Investment bank) contains frequent references to the need to avoid the area and be able to react to any findings made during construction. Other web sources indicate that there was something of a fight to get it diverted around Apollonia and even that it is still too close. If so then it is a bit late now even though Albania keeps running out of money to complete it! If you ask Albanians what is the most important historical site in their country that every tourist should see, most of them will answer: Apollonia. It can be a bit surprising because Butrinti and even the theatre in Durres are better known for foreign people. In my opinion the reason is that during the communist time Butrinti was totally out of reach but for some scientists – due to its location very close to the border with Greece. It means that people have heard about Butrinti but had no chance to see it. Apollonia was always “open” and in the ’90 even the school groups started visiting Apollonia. Also in school Albanian children learnt more about Apollonia than about Butrint. Now the site of Apollonia is still being excavated, but only 30% of it was uncovered. You can see the Greek odeon, roman theatre, some baths, porticoes stoas, and a layer of ruins on the site of acropolis. The most impressive is partly reconstructed house of Agonothetes where almost every day just married couples come for a photo session. Apollonia flourished for 8 centuries and benefited from its location close to the sea, but after the earthquake in 4th century everything ended. The Christian community built a monastery on the foundations of the old temple and now this monastery is a small museum in which you can see artefacts excavated in Apollonia and around. If you follow the path that leads to the small hill opposite the acropolis you’ll reach some demolished bunkers built here during Enver Hoxha’s regime (It is hard to believe but they did it on an archaeological site!) and lots of Hermann’s tortoise – species in danger. Illyrian city of Apollonia can be reached from Fier by taxi or minibus (I was not able to localise the bus stand as there’s no bus station in Fier, so I took a taxi). I spent there 2 hours.